These deserted cliff tops, often wind swept and bleak, harbour quite a number of fresh water springs. 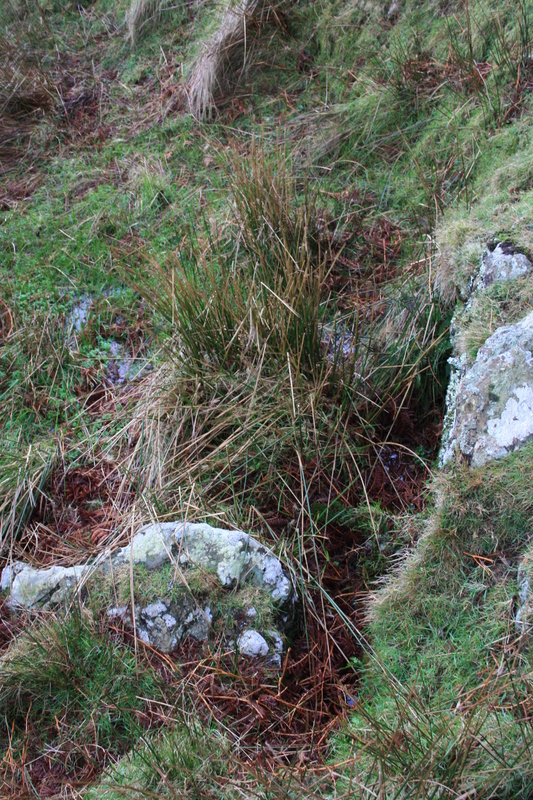 Close to the water’s edge, below where the church of St Mary once stood is the famous well of St Mary, Ffynnon Fair. Close to the coastal footpath some quarter of a mile or so further along the coast we find the much less well known Ffynnon Armon. It is difficult to imagine this spot, now a destination for bird watchers and walkers and virtually deserted on our latest visit, once having been a hive of activity, pilgrims and fishermen both used the various inlets as natural harbours from which to set out to sea. On the cliff tops the church, houses and farming occupied the ground. Water and named wells were important to all. Still, it is difficult to understand why a well to St Garmon should feature amongst their number; his connection with the island seems remote in comparison to the other saints connected with the pilgrimage. We have met with three other wells carrying his name across North Wales, and all within communities that are also named after him. Still he remains at best a shadowy figure, with researchers putting forward a variety of possibilities for his history and association with Wales. Maybe there really are more than one original Garmon, and the various Garmon wells are not all named for the same one. We take the attribution of this well to Garmon from work carried out in the 2000s for the Llyn Area of Outstanding Natural Beauty Management team in Gwynedd County Council. I haven’t seen any other documented evidence for the dedication of this well, so we must assume the name is locally handed down knowledge. 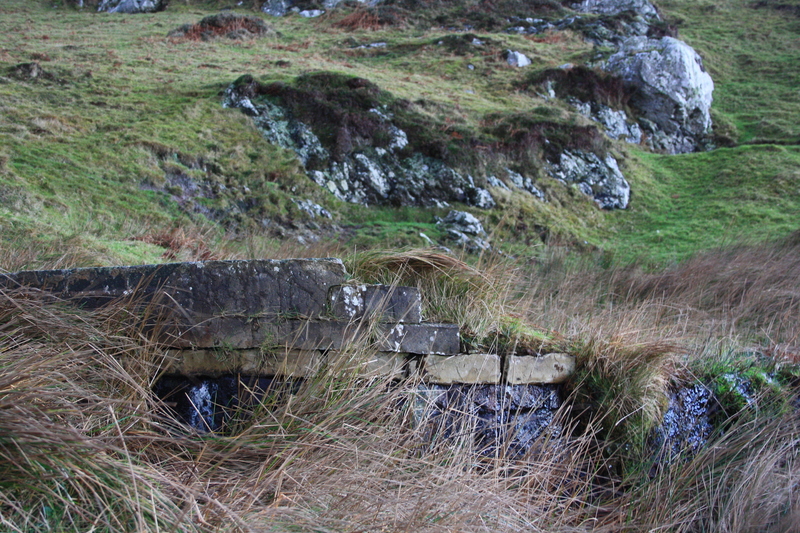 The well lies on the hillside close to a precipitous drop down to the sea. One side is marked by a large rock, with a smaller stone to is back. Earlier pictures seemed to indicate more stonework on other sides, although no evidence of this was to be seen during my visit. The centre of the spring was overgrown with reeds, although the water was definitely flowing underneath, my feet sank deep into the pool. About 20 yards to the north east of the spring, and even closer to the drop into the sea, a curved brick dam has been built. Apparently with the purpose of trapping the outflow from the spring to for, a drinking pool for livestock roaming on the hillside. The presence of this feature has been taken as being indicative of the reliability of the spring during drier weather. In the wet weather around during our visit there were certainly more accessible water sources available. 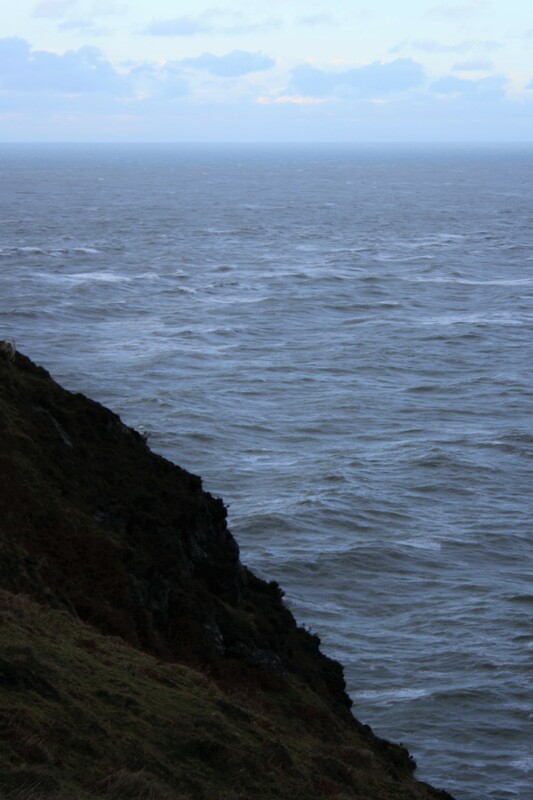 This Ffynnon Garmon is not one to seek out for its curative powers or to marvel at its construction and survival; but it does make for an exhilarating walk around the cliff tops, especially on the wild and windy December day we made the journey.